A carving knife is a woodcarver’s best tool and companion in creating beautiful wooden sculptures. It’s impossible to carve without a knife unless you have superhuman hands sharp enough to make detailed cuts on wood. Wood-carving knives then should be kept sharp and firm, so carvers can work on their wooden art pieces with ease and safety. Woodcarvers are more prone to getting cut with a dull blade than with a sharp one. A sharp carving knife clings into wood better than a dull one, preventing slips that cause injuries. It’s hard to do detailed strokes with a dull knife, the cut may not go as you expect. You’re most likely to end up with a ruined masterpiece with a dull carving knife. Sharpen your wood-carving knife well before starting your artwork. Heed the following techniques to achieve the kind of sharpness you want, so you need not spend more time sharpening than you do with carving. There are various types of sharpening stones used to sharpen wood-carving knives. They’re made out of different minerals, and they vary in texture. The Diamond sharpener, Arkansas wet stone, ceramic stone, and Japanese water stone are examples of sharpeners for carving knives. There are stones that need oil or water for lubrication, some do not. Make sure to follow instructions in the manufacturer’s manual so you’ll make use of it the right way and get the best results. When you carve on wood, you keep shifting from a certain angle to another in trying to make the right cut to achieve a certain form. This is one of the challenges in wood carving. When it comes to sharpening chisels, you have to maintain the right angle throughout the whole process to keep your bevel from becoming curved or rounded. Once this happens, the cutting performance of the tool also deteriorates. Make sure to keep the bevel flat while sharpening to avoid this. This sequence is important to achieve great results. You don’t want to end up honing a knife with remaining chips on its edges. In trying to sharpen a rusted carving knife with rough indentations from heavy usage, use a coarse stone, then proceed to medium-fine or fine, then to honing. You need a medium-fine stone before proceeding to a fine one if the knife is really old, rusted, and chipped. Once you get this done, you’ll be a few steps away to finally having fine details carved into that wooden rocking horse or table centrepiece. After around fifteen minutes of constantly working, check for small dents on the knife’s edges. The presence of dents means you have to keep working until they become invisible. These dents are tiny, shiny spots along the cutting edge of the knife that make it dull. Keep sharpening the knife until these dents totally come off. This allows you to have more grip control over the carving knife for optimum results. Doing so helps you make sure that the entire cutting edge is sharpened and the level is equal. Moreover, be careful during the whole sharpening process to avoid injuries. 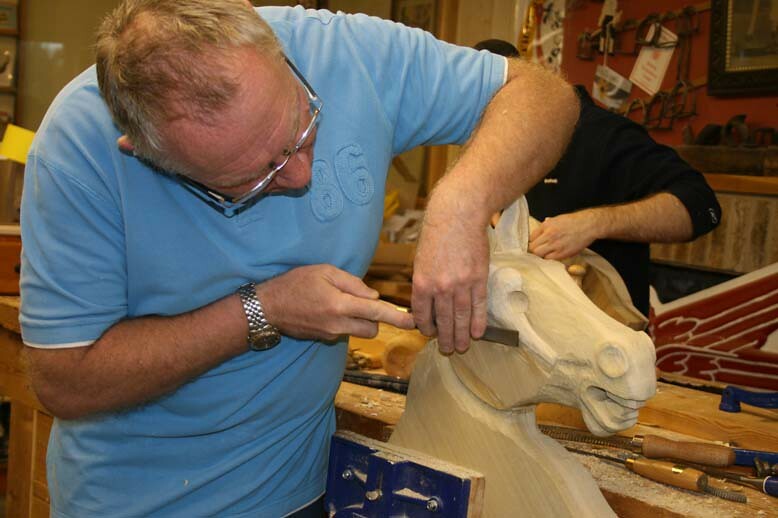 Once you get everything done, you’ll get to proceed with etching the final touches to that wooden rocking horse restoration project or any wooden masterpiece you want to finish.